Summer is almost over, I am counting down the days until school begins. These last couple of weeks have been pretty rough. The boys are getting bored, fighting, grumpy, tired… They certainly have their great moments, they are just fewer than usual. Plus for some unexplained reason they refuse to sleep. They are up around 5:30 in the morning which makes them tired and grumpy in the afternoon. The witching hours have returned. Naps aren’t usually feasible, besides I want them to go to bed on time so Josh and I get a little adults only time. Speaking of which, Josh has been working long hours and six day weeks. This means it’s just me and the boys even more, making running errands insane to impossible. And of course the boys miss Daddy, Jack gets sad and cries at night if he hasn’t seen his Daddy that day. So like I said it’s been rough. Because of the insanity of errands I have resorted to more cooking from the pantry and fridge. This is the first week I haven’t planned anything because I simply couldn’t get to the store. The boys had a swim day so I needed a meal that I could make early in the afternoon and pop in the fridge. Then when we arrive home right at dinner time with three very hungry boys dinner would be ready to put on the table immediately. This meal fit all my needs and it used ingredients from the pantry, fridge and garden. Pasta salads are ideal this time of year since you can make it early in the day, thus boiling the pot of water before it gets too hot. Then you enjoy a cold meal when the heat is at it’s most ridiculous! In my scavenging I came up with bow tie pasta, a favorite with the boys. Veggies were a little slim, tomatoes from the garden and some lettuce. 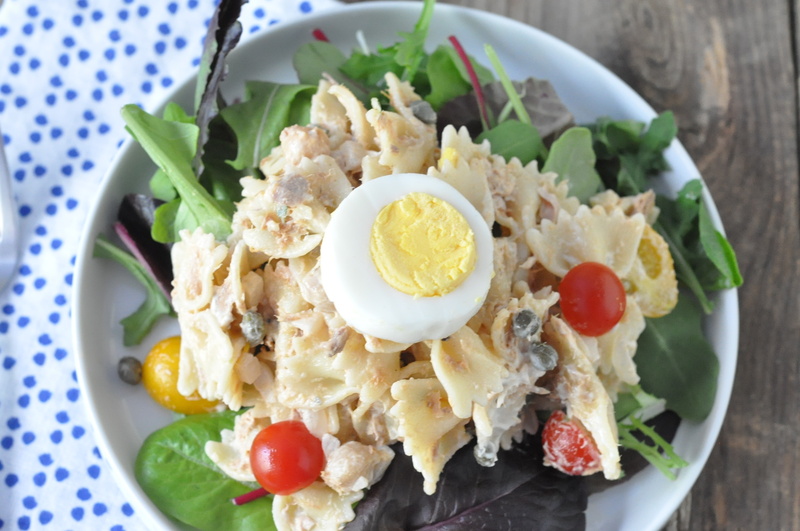 I wanted to make sure I had plenty of protein since they would be famished after swim so I went with canned tuna and hard boiled eggs. Then to up the protein even more and add fiber I put in some chickpeas which I always have on hand for salads. The dill was pathetic looking so fresh thyme from the garden would have to do. And finally for my little addicts, some capers. If the boys had it their way they would eat a whole jar of capers! 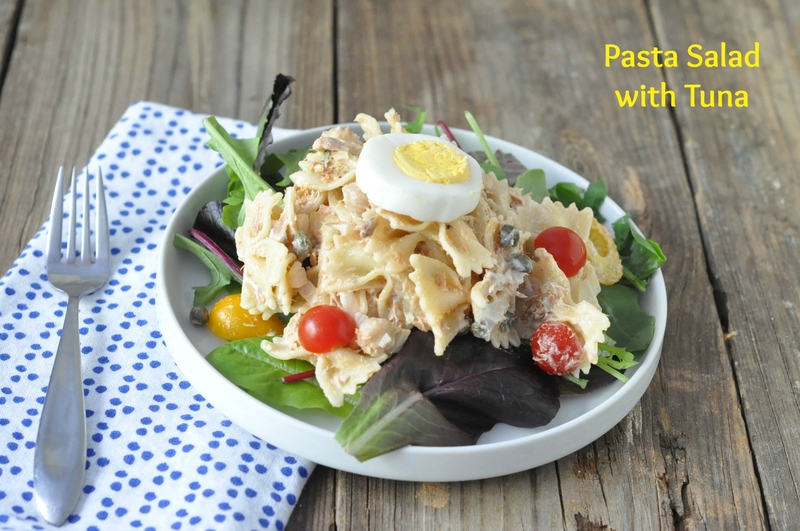 This pasta salad really was a winner. The boys were over the moon happy with it. Ewan asked for seconds before he even finished his first serving. Jack had two servings as well. They asked if they could have it for breakfast. The only negatives in their eyes were the red tomatoes which they don’t like and not enough capers. I’m pleased they enjoyed it so much, hopefully you will too. Cook the pasta until al dente according to package instructions. Drain the pasta and place in a large bowl. Add the mayonnaise, salt and pepper. Stir until the pasta is thoroughly coated. Add all the rest of the ingredients except the eggs and stir until combined. Place slices or wedges of egg on top, cover and put in the fridge until chilled. 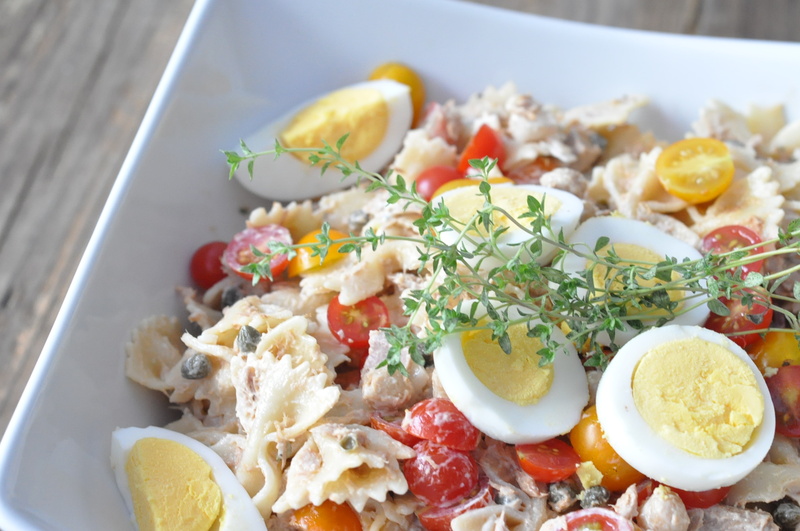 This entry was posted in Pasta, Salads and tagged capers, easy, make ahead meal, Pasta salad, quick, summer meal, tuna on August 13, 2015 by Gretchen. I’m the same when it comes to tuna. Either a sandwich or added to a tossed salad so this was great. A cold twist on the classic tuna casserole or something like that. It is a blessing to be able to be home with them, though at times it may seem like a curse! I will give this one a try. We’ve had a long, hot summer here and have needed to eat cold meals quite often. This sounds like a perfect addition! Our summer has been incredibly long and hot too. Oddly enough we haven’t had as many cold meals as usual, not sure why. This was a very welcome and delicious change. What a great scratch meal – plenty of nutrition and very filling for hungry boys! Coping with bored kids at the end on the long summer holidays is a bit of a challenge – but it won’t be long and they’ll be off to school again. This picture has made me feel hungry! so yummy! Thanks! It definitely was popular around here. This is a whole meal in one plate. It looks pleasant to the eye and delicious to the palate, and healthy with all the fresh tomatoes, some tuna and chickpeas. I think it must be filling too…pasta and chickpeas can certainly fill the stomach. I love the photographs. They are lovely! Thanks Liz! It’s great get g one meal on a plate easily. Mathis was a winner with the boys!